Athletes work hard and so do their bodies. This often means that they are on the receiving end of some painful sports related injuries affecting their mobility. The good news is that treatment through the form of sports massage can alleviate the tension and pain in some of the most common sporting injuries which we treat here at Mobilise Remedial Massage. Our therapists are trained in the subtle distinctions of sports massage, which restores mobility and eases pain. We treat many sporting injuries, either solely with sports massage therapy or as part of a larger pain management solution. Here are 4 examples of common sporting injuries that we treat. Typically affecting athletes who need to jump regularly, particularly those playing netball, basketball and volleyball, this injury is caused when the patella tendon in the knee begins to deteriorate. Symptoms and severity range and can include stiff and achy knees after exercise, weakness in calf muscles and knee pain. You guessed it – this one is common in tennis players and also those playing other racquet sports. Tennis elbow is characterised by problems when lifting and pain surrounding the elbow and elbow itself, and can also be experienced by those who repetitively lift and even those who play instruments. Joint and neural mobilisation techniques can help to alleviate some of the discomfort caused in this condition, as well as soft tissue massage and home rehabilitation. 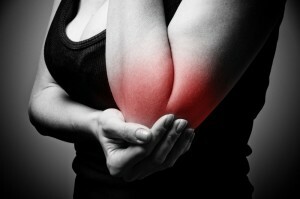 This occurs when the joints and muscles that operate the shoulder receive wear and tear. Movements including swimming strokes and cricket bowling can cause strain to the muscles in the shoulder. Severity depends on how much strain has occurred, with typical symptoms including reduced mobility in the shoulder and upper arm. Myotherapy techniques like massage and joint mobilisation can help to alleviate muscle tension, reduce pain and restore mobility. When it comes to muscles torn, strained and pulled as a result of sport physical therapy in the form of a sports massage can work wonders and get an injured body ‘up and running’ once more. To find out more about our sports massages, call the Brisbane masters of massage at Mobilise Remedial Massage on 0473 090 442 for our Toowong centre.